We spent all of yesterday in the Linked Data on the Web Workshop. It was quite an intense day with 27 different presentations, most of which were paper presentations in addition to a few demo’s. It was an excellent workshop so full credit to everyone who helped organise the event. The workshop began with some short introductions by Sir Tim Berners-Lee, Chris Bizer and our very own Tom Heath. Both Chris and Tom did a great job chairing the workshop during the day and deserve credit for their efforts. After the introductions we went straight into presentations. I won’t try to describe every talk because there were so many and all of them were very good. I just want to talk about some of the highlights for me during the workshop. done as it should be. The Semantic Web isn't just about putting data on the web. can find other, related, data. Unsurprisingly every one of the presentations in the workshop aimed to describe technologies, processes, techniques and examples of linking data together semantically, to help make this vision a reality. There are many obstacles to being able to do this, some of these obstacles are technical but others are social and legal (You can view the workshop schedule here and download all of the papers), and we need to understand them all. We Talisian’s did a couple of presentations during the workshop. I was originally supposed to present the Semantic Marc paper with Rob, but we only finished the slides the night before and decided it would be easier if he presented it without an interruption to change speakers. This proved to be the right decision since he did an excellent job, and we got some great feedback from many of the attendees. One of the major themes that across in many of the talks, which was also a central theme in our paper, is how to handle disambiguation. There were a number of presentations that touched upon this issue most memorably the presentations by Alexander Passant on The Meaning of Tags, and Affraz Jaffri’ presentation on Uri Disambiguation. I was also impressed by Jun Zhao presentation on Provenance and Linked Data in Biological Datawebs, I was fortunate enough to visit HP Labs last year and see Graham Klyne, one of her colleagues, present some of their work and it’s great to see how well they are doing. I was also impressed by some of the work that Christian Becker has been doing with Chris Bizer on DBPedia Mobile a location centric DBPedia client application that uses a really cool Fresnal based Linked Data browser. Peter Coetzee’s work on SPARQPlug was also very impressive, and I’ve made a mental note to have a play with it as soon as I get back to the UK. I could carry on and on but I think it’s sufficient to say it really was a wonderfully useful workshop, and I thoroughly recommend reading all of the papers that were presented. Oh and I have just realised that Rob has posted up his thoughts about the workshop here. I’ve also uploaded the first set of photos I’ve taken to my flickr account which I have organised into this set, enjoy!. It’s 10:30am on Monday 21st April local time here in Beijing as I sit in a hotel room and reflect on the last 36 hours. It feels like its been a long and arduous journey my whole body seems to be aching which is unusual. The journey began in Birmingham on Saturday evening, my brother and uncle dropped me off at Birmingham International Airport at about 6pm. I checked in with no difficulty at all and gave Rob a quick call to let him know I had arrived and was going to proceed through security into the departure lounge. As I walked towards to the security checks I ran into Tom who had just arrived at the Airport and told him where the check in counter was and that I’d be with Rob in the departure lounge. Tom walked off to get checked in and I went and queued to get through the security checks. I was left trying to explain The Semantic Web to someone who admitted he only kind of had an idea of what eBay and Google was. At this point I was getting visibly shaken, having been stood there for over twenty minutes. I simply didn’t know whether the officer believed a single word I was saying. It occurred to me that I had my Letter of Invitation from the Conference Organisers which I handed to the Officer, and then explained that the Conference was an annual event and each year the venue changed. I remember thinking, cool now he know’s why I’m going – the letter kind of proves that, now I have to convince him I’m actually presenting. So, rather comically, I reached into my laptop bag and pulled out a copy of Nodalities Magazine, which contains not only an article I’ve written but also picture of me, and intimates that I along with some of my colleagues would be presenting at the annual WWW2008 conference. This seemed to convince him a little more, or at least I thought it did until he started asking all the same questions all over again. At this point I semi lost my temper. I played the only card I had left, and told him to phone Inspector Williams who heads up security at the airport and ask him to vouch for me. On reflection I hate the fact that it came to that, but I was becoming rather frightened, and trust me … Orange is not a good color on me, and I was starting to have visions of me wearing an orange jump suit. At that point the officer took my letter of invitation, my passport and disappeared behind a security screen. I was left waiting anxiously. It was at that point that Rob wondered back into the security check area. He had been waiting in the departure lounge for me for almost half an hour and had become worried that I had not appeared, so wondered back in to see where I had disappeared to. He saw me standing at the police check counter and walked over and asked me if I was ok. I explained what was happening and he made a joke about it, which was good actually because it calmed me down. Anyway Rob stood their with me, which was a wonderful gesture, and even as I sit here and write this I’m still touched by it. The officer returned with my things and then apologised for detaining me, and said he hoped he hadn’t caused any offence, and told me I could go. At this point it’s important to point out that whilst I didn’t enjoy the experience one bit, the officer in question was impeccably polite. Rob and I went and sat in the departure lounge and it took me a few moments to compose myself. In fact it took a bit longer than that, the entire episode played in my mind for much of the evening. It’s sad but it’s the world we live in. Rob and I waited around for Tom, who eventually arrived through security and the we walked through to one of the private departure lounges that I had access to, and I signed the guys in as my guests and we sat and relaxed and waited for Chris. The flight was delayed a little while so comfort of the private lounge with free snacks and drinks gave us a chance to natter and me a chance to gather my equilibrium a part of me was still seething but also rather shaken by events. Tom repeatedly asked me if I was ok as did Chris, whilst Rob repeatedly made fun of me … which was probably exactly what I needed … thanks buddy! We finally boarded about 9:30, I was sitting next to Rob for the flight so played chess, chatted, and I think we both managed to get some sleep. We arrived in Dubai seven hours later for a four hour stop over. We got off the plane but Tom got separated from us. Rob, Chris and myself got through the Connecting Flights security bit but there was no sign of Tom anywhere and we started to worry a little bit that he had stayed on the bus might have ended up in immigration control. It was at that point Paul found us and we explained how we had lost Tom … but not for long he turned up and explained the bus had stopped at a different entrance. We had a quick look around at some of the electronic gadgets on sale and then walked back to one of the private lounges at the airport, I signed the guys in and we had chilled in there for the next few hours. Had some wonderful food, drink, chatted, took photos, some of us even took the opportunity to get showered as we waited for our connecting flight. This flight was also approx seven hours long, I spent this leg of the journey sitting next to Chris. We also played chess and talked a lot about work and ideas we had. Paul joined us for a while as did Rob and we had a great time just chatting about work, ideas, the conference, etc. We even managed to take some photos on the plane. We arrived in Beijing airport at about 11pm local time and since none of us had flown here before we had no idea what to expect. We were all amazed at the sheer spectacle of the terminal. It is an amazing looking building not to mention absolutely huge … we had to catch a train from immigration to where we collected our baggage … that’s how huge! We found our way out of the airport and ended up waiting in the longest queue ever for a taxi. Eventually a guy in a toyota hiace wondered over to us and offered us his services so we accepted and arrived at the Beijing Continental Hotel at 2am – only to discover that the had given our rooms away. We were all getting a little annoyed but eventually the hotel agreed to put us up in another hotel for the night and collect us in the morning – in fact I’m sitting in the taxi waiting for the others to check out as I write this. All in all it feels great to be in China, I think I’ve managed to put the emotions of the earlier parts of this journey behind me. Now I just want to look forward to the conference and having the opportunity to speak to and interact with some amazing people. Am very excited! Am flying out to Beijing for WWW2008 this evening with fellow Talisians: Tom, Rob and Chris. We are meeting with our colleague Paul in Dubai where we stop over briefly on Sunday, and then its on to China! It’s going to be a great conference. We are all presenting in the Linked Data Workshop which looks really interesting this year. As long as we have decent internet access I’ll be uploading pictures to my flickr account and blogging here as well as over on our Nodalities blog. 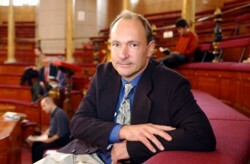 Sir Tim Berners-Lee, often credited as the inventor of the World Wide Web and also Director of the World Wide Web Consortium, recently chatted with my colleague Paul Miller as part of our Talking with Talis Podcast Series. You can listen to the podcast here, or download the mp3 from here. Alternatively you can read the full transcript here. It’s a excellent podcast which I’ll recommend to anyone who is interested in understanding the Semantic Web. It’s a far ranging discussion in which Tim talks about a number of issues ranging from the importance of Linked Data to the perceived Readiness of the Semantic Web and it’s mainstream adoption. I thoroughly enjoyed listening to the podcast and in some ways it felt good to get the sense that as an organisation we are actually building the sorts of technologies that will help bring Tim’s vision to life. I thinkâ€¦ weâ€™ve got all the pieces to be able to go ahead and do pretty much everythingâ€¦ you should be able to implement a huge amount of the dream, we should be able to get huge benefits from interoperability using what weâ€™ve got. So, people are realizing itâ€™s time to just go do it. I totally agree with Tim, at Talis we have done exactly that, we have invested a lot of time and effort into building our Semantic Web Platform which is currently underpinning many of our next generation products. And allowing us to collaborate with others on some pretty interesting projects. The Semantic Web is fast becoming a reality and it feels pretty awesome riding this particular wave at the moment. I’m also pretty excited at the moment Rob, Tom, Paul, Me and Chris will all be attending the LinkedData Workshop at WWW2008 next month in Beijing. Rob and I will be presenting our paper – which should be great fun. So if any of you are out there and want to find out more about us and what we are doing come along and have a chat!